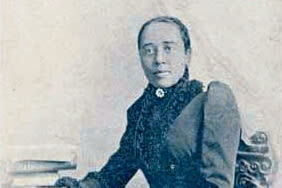 Anna Julia Haywood Cooper (1858-1964) is remembered as an educator, orator and early black feminist. She was born into slavery but, after gaining freedom, began attending Saint Augustine's University in 1868. After graduating there, Cooper earned additional degrees from Oberlin College in Ohio and Paris’s Sorbonne. Her distinguished career in higher education and her book “A Voice from the South” have caused Dr. Cooper to be quoted on the U.S. passport and depicted on a 2009 U.S. postage stamp.